The IBM Informix® Dynamic Server (IDS) has the tools to build a powerful data warehouse infrastructure platform to lower costs and increase profits by doing more with your existing operational data and infrastructure. The Informix Warehouse Feature simplifies the process for design and deployment of a high performance data warehouse. With a state-of-the-art extract, load, and transform (ELT) tool and an Eclipse-based GUI environment that is easy to use, this comprehensive platform provides the foundation you need to cost effectively build and deploy the data warehousing infrastructure, using the IBM Informix Dynamic Server, and needed to enable the development and use of next-generation analytic solutions . 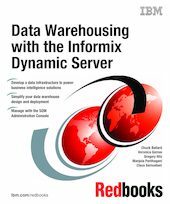 This IBM® Redbooks® publication describes the technical information and demonstrates the functions and capabilities of the Informix Dynamic Server Warehouse Feature. It can help you understand how to develop a data warehousing architecture and infrastructure to meet your particular requirements, with the Informix Dynamic Server. It can also enable you to transform and manage your operational data, and use it to populate your data warehouse. With that new data warehousing environment, you can support the data analysis and decision-making that are required as you monitor and manage your business processes, and help you meet your business performance management goals, objectives, and measurements.